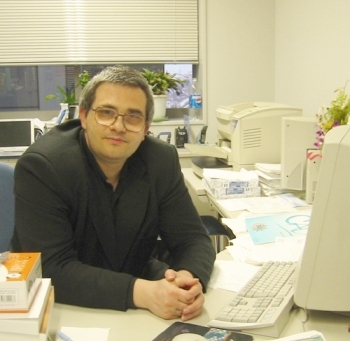 Alexander Pasko graduated from Moscow Engineering Physics Institute (MEPhI) in Russia in 1983 and received a PhD degree in 1988. He was a senior researcher at MEPhI from 1988 to 1992; an assistant professor at the University of Aizu, Japan (from 1993 to 2000); associate and full professor at the Faculty of Computer and Information Sciences of the Hosei University in Tokyo, Japan (from 2000 to 2007). Geometric images are probably the eldest product of the human brain. In the modern logically-oriented life it is extremely important to keep and develop this ability. I am convinced that outstanding achievements in science and technology can only be attained in the balance of logic and geometric reasoning. There are many ways of modeling geometry by means of a computer. We try to find an approach dealing with geometric objects in the most simple and uniform manner. Thus, the Function Representation (FRep) of geometric objects has been introduced with set-theoretic operations based on the theory of R-functions developed by Russian mathematicians. This representation is independent of the space dimension. That is why time-variant or animated objects can be described in the same way, with time being considered as one of the coordinates of space-time. Many unusual geometric operations such as blending, metamorphosis and even "hair growing" can be functionally described. It seems we now have "experimental geometry" by analogy with experimental physics, where new results usually have to be explained from the theoretical point of view. This becomes even more complex when dealing with heterogeneous volumetric objects and multidimensional models. Combining rigorous mathematical models with powerful parallel computers, we will get an instrument for the future creative work in design, medicine and biology, industry and art. FRep Home Page presents descriptions of selected research topics, list of publications, images, and animations. HyperFun project provides tools for FRep modeling using the HyperFun language. "Function representation of solids reconstructed from scattered surface points and contours ", (with V. Savchenko, O. Okunev and T. Kunii), Computer Graphics Forum, vol.14, No.4, pp. 181-188 (1995). "Geometric modeling in the analysis of trivariate functions ", (with V. Pilyugin and V. Pokrovskiy), Computers & Graphics, vol. 12, Nos. 3/4, pp. 457-465 (1988).